At the graduate level, the Chemistry Department features a research-based Master of Science degree. After completion of core coursework in the major sub-disciplines, students in the Chemistry M.S. program have the opportunity to participate in a wide range of research experiences, including environmental, organic synthesis, natural product isolation, computational and theoretical, analytical, nanomaterials, catalysis, polymers, biochemistry, and chemical education. The research experience is considerably enhanced by MTSU’s new 250,000-square-foot science building and upgraded instrumentation. Talented undergraduates also have the opportunity to participate in a new Accelerated Bachelor’s/Master’s (ABM) program which enables them to complete a bachelor’s and master’s degree in five years. Graduates find employment in a wide range of areas as well as continuing their education in high-quality doctoral and/or professional programs. The department also participates in three interdisciplinary Ph.D. programs (Molecular Biosciences, Computational Science, and Math and Science Education). Dr. Charles Chusuei and student researchers are getting a big boost with the new science building as they develop a technology that could transform patient care in emergency rooms and health centers worldwide. The MTSU professor and his team are working to produce nanotech-based sensors using cheaper, earth-abundant materials such as zinc oxide instead of employing precious metals such as gold, silver, and platinum. “A common theme of nanotechnology is determining how material size and shape affects chemical reactivity,” says Chusuei, who has a patent pending. “Our research team has shown that zinc oxide (ZnO) shape selection in the nanocomposite formulation (involving carbon nanotubes) dramatically improves its biosensing properties.” The technology could impact such things as early cancer detection, monitoring food spoilage, oxidative stress, and cardiovascular disease management by monitoring hydrogen peroxide on a molecular level, or physical distress from anaerobic respiration with lactic acid as a marker. The $147 million science building offers better infrastructure for surface characterization instruments, such as an X-ray photoelectron spectrometer, and new equipment that includes a physisorption and chemisorption surface area analyzer. Technology at MTSU similar to what is seen in Avatar “brings science to life,” says Dr. Anatoliy Volkov, associate professor of chemistry. Student researchers say the advanced 3D visualization and GPU-based high-performance computing sets MTSU apart from other universities. The MT 3D VizLab, short for the Stereoscopic 3DVisualization Laboratory, can be used to perform high-level research in various scientific disciplines including chemistry, biology, economics, engineering, geoscience, and health care. The lab is equipped with NVIDIA’s 3D technology and includes a stereoscopic 3D projector, a 16-display 3D hyperwall, and 25 pairs of 3D shutter glasses. The wall can visualize a single image across all 16 monitors, or each monitor can have a programmable relationship to other images. Volkov and colleagues have applied for external funding for a much larger 3D tile wall and for another lab with a 3D projector and 50 3D glasses. MTSU chemistry professor Dr. Preston MacDougall, as a NASA Ames Research Center summer fellow, collaborated with the inventors of hyperwall technology to extend its application to molecular visualization and drug design. His grant proposal brought the 3D hyperwall to MTSU. The Department of Chemistry offers a Master of Science (M.S.) degree with a major in Chemistry. A minor in chemistry is also available at the graduate level for other students. NOTE: All chemistry students must take or have taken Quantitative Analysis before graduation and as a prerequisite for CHEM 6230 Intermediate Analytical Chemistry. A limited number of graduate teaching assistantships and graduate research assistantships are available to students who show academic promise and potential as effective laboratory teachers. Graduate students pursuing an M.S. 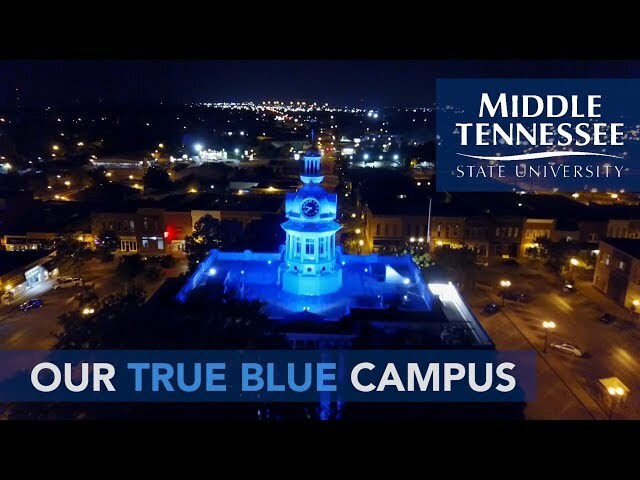 degree in Chemistry may also apply for a limited number of MTSU STEM Masters Scholarships, based on financial need and academic talent. Students must earn a minimum of thirty hours of credit to graduate with an M.S. degree in chemistry. The thirty hours include a minimum of six lecture classes, plus chemistry seminar, chemistry research, and thesis research. Of the six lecture classes, four are required in the core areas of analytical/instrumental, inorganic, organic, and physical chemistry. Undergraduate students may pursue a Bachelor of Science (B.S.) degree with a major in Chemistry or with a concentration in Professional Chemistry. Other departmental majors leading to a B.S. include Biochemistry, Science, and Health Science, under which numerous pre-professional programs are coordinated. Undergraduate and graduate minors in Chemistry are available. The Department of Chemistry offers a Master of Science degree with a major in Chemistry. The department also participates in the interdisciplinary Ph.D. programs in Computational Science, Molecular Biosciences, and Mathematics and Science Education and its concentrations in Biological Education, Chemical Education, Mathematics EducationInterdisciplinary Science Education. Also offered is a minor in Chemistry at the graduate level. Admissions are based on a comprehensive assessment of a candidate's qualifications including a satisfactory score on the Graduate Record Examination (GRE) and undergraduate and graduate grade point average. Selection of a research problem, review of pertinent literature, collection and analysis of data, and composition of thesis. Once enrolled, student should register for at least one credit hour of master's research each semester until completion. S/U grading. Offered every term. Required of graduate students specializing in chemistry. Scientific articles reviewed and reports on individual research projects presented. Offered every term. Original laboratory problem that will furnish material for a thesis. Offered every fall.